Georgian naval ships stood no chance against Russian forces and “turned 180 degrees” without engaging them at all. Also Georgian Navy simply didn’t have the capability to fire missiles at Russian ships and that to do so would be suicide. One of the damaged Georgian ships has been removed from the water and two others remain partially submerged. What you see is one of the photographs of partially sunk Georgian naval ship taken at Poti by Gavin after the Georgia-Russia conflict. Here is the full coverage of “What happened to the Georgian navy?” by Gavin’s Blog. 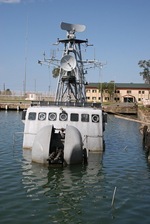 You can view more photographs of damaged Georgian naval ships by Gavin in Flickr. A eleven minutes video clip of Russian Navy engaging Georgian Navy is here.